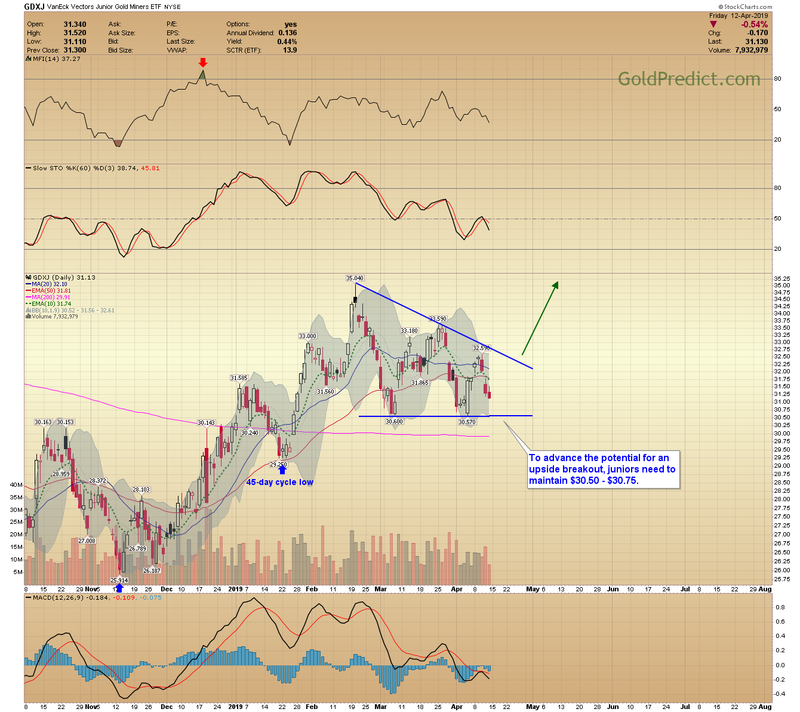 Metals and miners continue in their sideways consolidations. 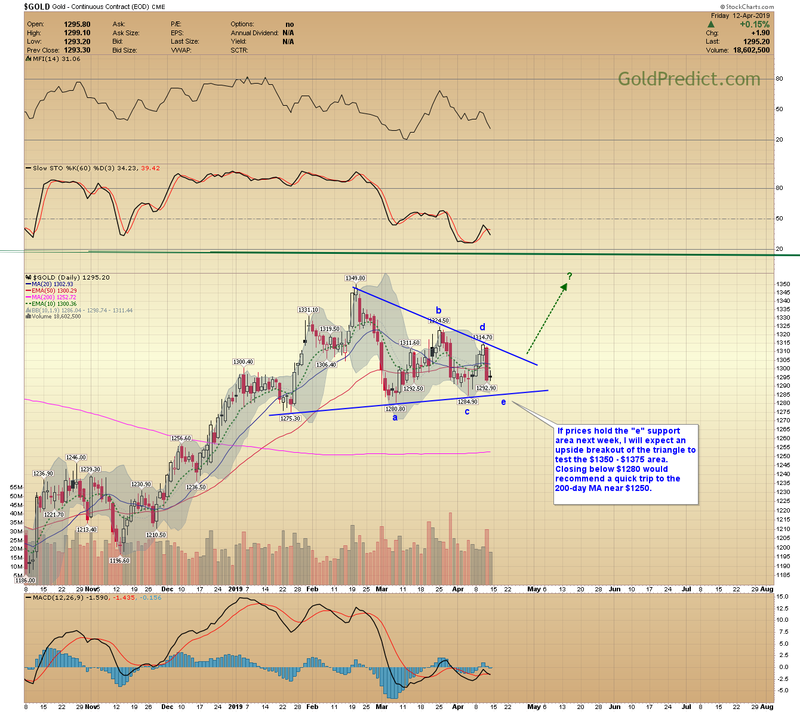 If gold holds the $1280 – $1285 area next week, we could see an upside breakout from the triangle that challenges $1350 – $1375. Closing below $1280 would imply a breakdown from the triangle. We will be updating the website and changing the color gauges within the next week or two. 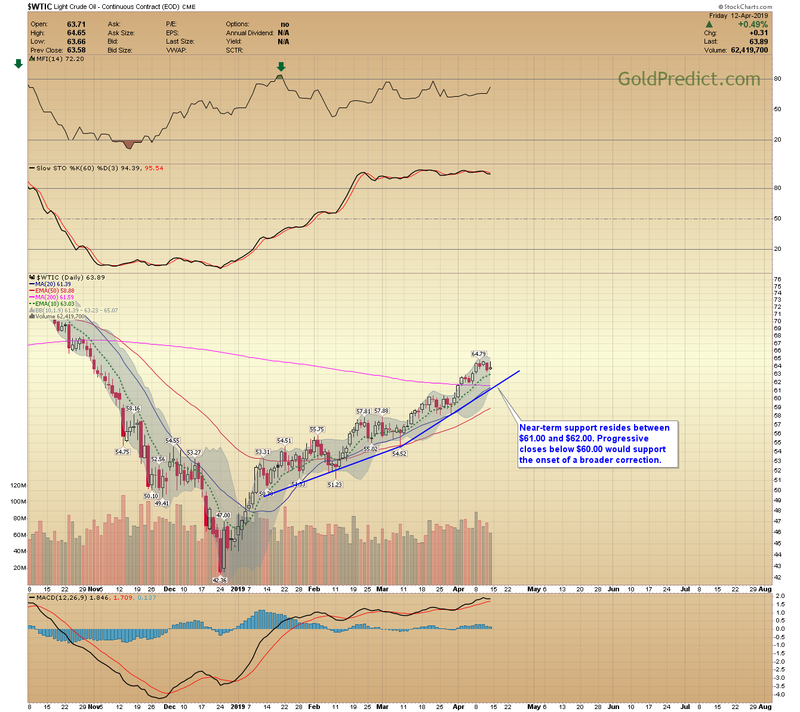 I created two new indicators specific to gold that should work much better. The long-term indicator describes where we are in the overall big picture while the medium-term gauge applies sentiment and investor interest to help time the intermediate cycle. I’ll explain the new indicators before we get ready to launch. I think they will be significantly more helpful than the current configuration. If prices hold the “e” support area next week, I will expect an upside breakout of the triangle to test the $1350 – $1375 area. Closing below $1280 would recommend a quick trip to the 200-day MA near $1250. 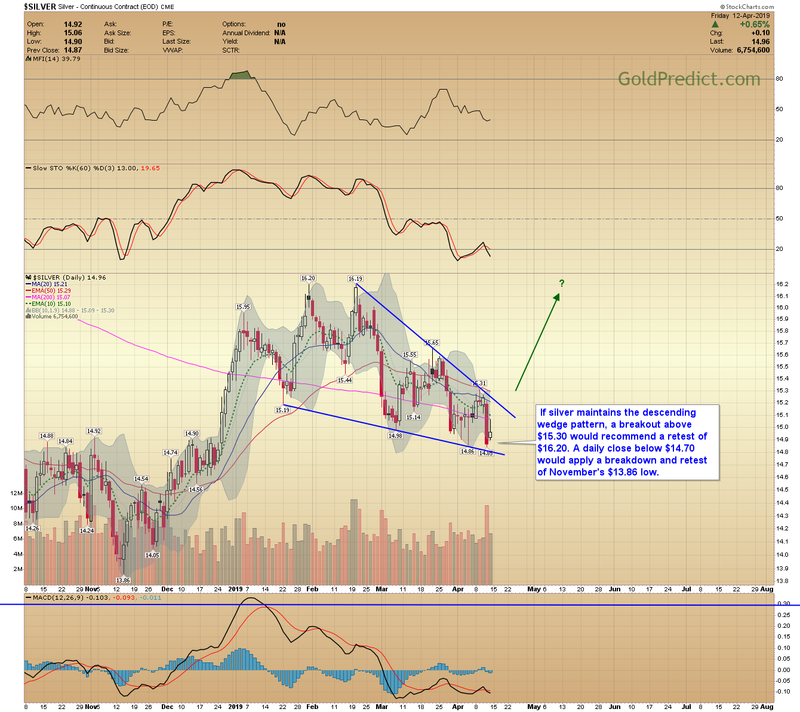 If silver maintains the descending wedge pattern, a breakout above $15.30 would recommend a retest of $16.20. A daily close below $14.70 would apply a breakdown and retest of November’s $13.86 low. 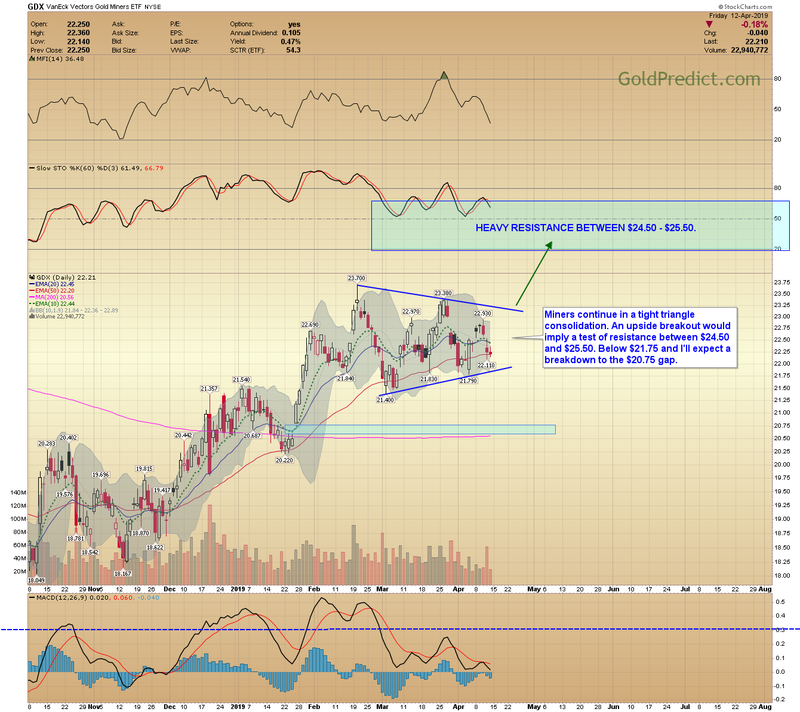 Miners continue in a tight triangle consolidation. An upside breakout would imply a test of resistance between $24.50 and $25.50. Below $21.75 and I’ll expect a breakdown to the $20.75 gap. To advance the potential for an upside breakout, juniors need to maintain $30.50 – $30.75. Prices reached a new all-time high in SPY. I see the potential for a broadening wedge topping formation. 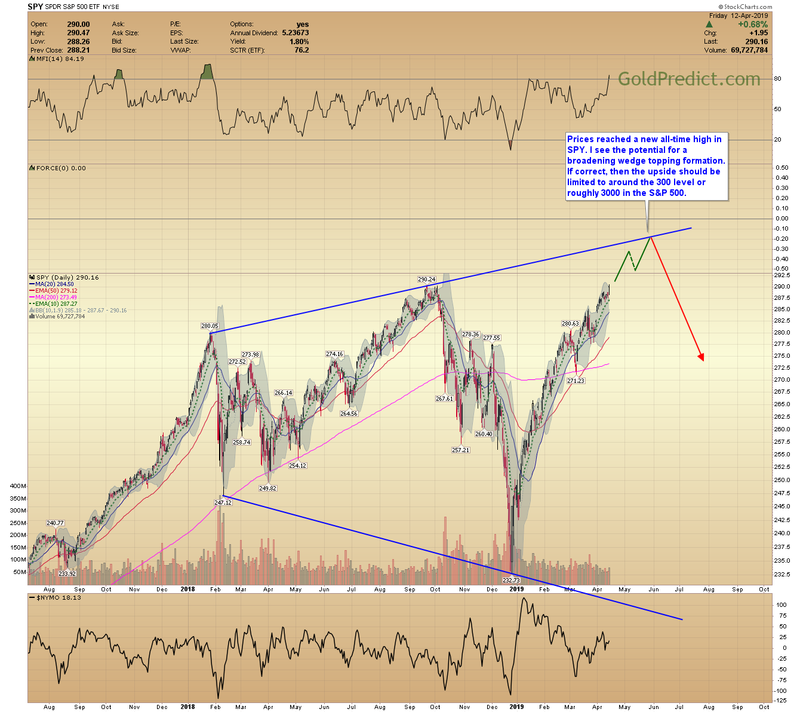 If correct, then the upside should be limited to around the 300 level or roughly 3000 in the S&P 500. Near-term support resides between $61.00 and $62.00. Progressive closes below $60.00 would support the onset of a broader correction. Key support for the DNR trade ranges between $2.10 and $2.20 next week. I placed a stop just below the $2.00 level.